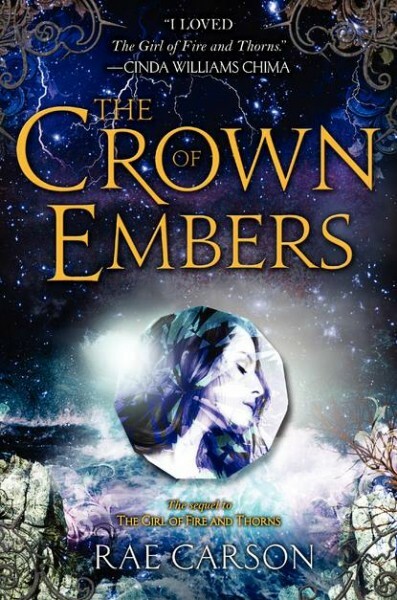 The Crown of Embers has a cover!! To conquer the power she bears once and for all, Elisa must follow the trail of long-forgotten—and forbidden—clues from the deep, undiscovered catacombs of her own city to the treacherous seas. With her goes a one-eyed spy, a traitor, and the man who—despite everything—she is falling in love with. I literally squealed when I saw the cover. *jump* Quite loudly. I adored the first book, its originality and its characters. The entire review on my blog was basically me squealling, I’ll be honest. You and Elisa seem to bring that out in me. *inlove* CAN’T WAIT! congrats on another awesome cover! can’t WAIT to read this! Lots of love from France! I JUST finished The Girl of Fire and Thorns, and I simply CANNOT wait for the upcoming book! In fact, I’m going to go ahead and re-read it, I loved it so much. i pre ordered crown of embers and couldnt wait to read it, when i got the book i couldnt put it down!!!!! i read it in a week! which is not me,lol the book is fantastic!!!! i cant wait for the next one, i dont want to wait a whole year! loved the book!!! I have just finish book two the crown of embers and I LOVED it, will there be a third one??? Im totally telling everyone to read it! I want to tell you I just finished Crown of Embers and It WAS FANTASTIC!!!!! I love your writing style,I love your characters and I adore the fact that you use the Word of God in this book!!!!! I look forward to the next book!!! !Truly talented and inspiring!!! I just tore through both of the novels in this series and just want to thank you! Delightful, thoughtful plotting and characters. Can’t wait for the third one! If you have an ARC giveaway for #3, I want to be in on it! Many thanks, and I’ll be telling friends & buying extra copies to give away! | Author of Books for Teens”, very compelling plus it was indeed a remarkable read. hi! , Everyone loves a person’s crafting a great deal! portion most people keep up to date your letters more to do with your posting upon America online? We demand a practitioner with this place so that you can solve our problem. Probably that is definitely a person! Taking a look in advance to peer anyone. completely, however this paragraph offers good understanding even. also love the theme/design), I don’t have time to read through it all at the moment but I have saved it and also added your RSS feeds, so when I have time I will be back to read much more, Please do keep up the superb work. say that I’ve truly enjoyed browsing your weblog posts. In any case I will be subscribing in your feed and I hope you write once more soon! Usually I don’t learn post on blogs, but I would like to say that this write-up very compelled me to try and do so! Your writing style has been amazed me. Thank you, very nice article. if it would generate any positive results. Many thanks. without the potential hazards of exposed or open heating elements. cooking ranges is the heat source.